This is a book about the modern experience of mortality — about what it’s like to be creatures who age and die, how medicine has changed the experience and how it hasn’t, where our ideas about how to deal with our finitude have got the reality wrong. As I pass a decade in surgical practice and become middle-aged myself, I find that neither I nor my patients find out current state tolerable. But I also have found it unclear what the answers should be, or even whether any adequate ones are possible. I have the writer’s and scientist’s faith, however, that by pulling back the veil and peering in close, a person can make sense of what is most confusing or strange or disturbing. 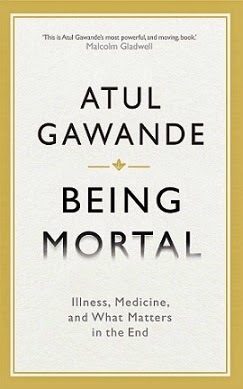 In Being Mortal: Illness, Medicine and What Matters in the End, surgeon Atul Gawande takes a close look at the processes of ageing and dying, and at how his patients, their families, and the medical system they turn to for help cope (or fail to cope) with the inescapable reality of mortality. Gawande’s main argument is that the modern medical system has a hard time acknowledging that as the end approaches, people may have priorities that go beyond merely surviving for as long as possible; giving patients the best possible care involves confronting this fact and making sure their individual needs are met. Jenny was right: Being Mortal is at times very difficult to read. It’s also an excellent book — a thoughtful and compassionate examination of questions for which Atul Gawande doesn’t always have an answer, but which he believes are worth asking anyway. Gawanda uses the story of his own father’s final illness and death as an overall narrative frame for Being Mortal, and the result is personal and very moving. I struggled a bit with the second half or so, which switches from mainly focusing on old age to discussing terminal illnesses that can hit people at any age. But this just proves Gawande’s main point, really: we don’t like to think about these things, and that unwillingness to confront mortality isn’t always good for us. So I’m very glad I read this book, even if it was difficult at times. As I said, Being Mortal is a questioning book. It’s also both compassionate and intellectually humble: for all his specialised knowledge and practical experience, Gawande never writes as someone who has all the answers and can bypass people’s will to determine what’s best for them — in fact, this is a model he rejects outright. On the other hand, he also has complicated feelings about the model modern doctors tend to follow instead: one where they give patients information about alternative options and then leave them to make a decision. Information is crucial and it’s something patients and their families should have, but processing it in a highly emotionally charged situation is not always something human beings are able to do. This means they need openness and support, but this is difficult for doctors to provide when they don’t necessarily know how to confront mortality themselves. Gawande suggests that it might help if doctors and patients alike were willing to discuss the fact that curing illness and prolonging life are not the only possible approaches or the only priorities medicine is allowed to have. We don’t always make choices that are 100% risk free and guarantee our safety when we’re young and healthy; we should retain that ability as we age or become ill. Gawande believes that it’s really important for people to retain a sense of authorship of their own lives, even if they’re constrained by immutable circumstances. What we do within the parameters set by those circumstances is ours; one of the most difficult things about the way we currently deal with old age and illness, Gawande argues, is that it so often takes that sense of authorship away from people. As I read Being Mortal, I learned a lot: not only about the challenges and realities of old age and terminal illness, but also about the importance of gerontology and palliative care and the specialised, contextual knowledge they use to help patients. I’ll be surprised if I read a better work of non-fiction this year. For more than half a century now, we have treated the trials of sickness, ageing and mortality as medical concerns. It’s been an experiment in social engineering, putting our fates in the hands of people valued more for their technical prowess than for their understanding of human needs. That experiment has failed. If safety and protection were all we sought in life, perhaps we could conclude differently. But because we seek a life of worth and purpose, and yet are routinely denied the conditions that might make it possible, there is no other way to see what modern society has done. I am leery of suggesting the idea that endings are controllable. No one ever really has control. Physics and biology and accident ultimately have their own way in our lives. But the point is that we are not helpless either. Courage is the strength to recognize both realities. We have room to act, to shape our stories, though as time goes on it is within narrower and narrower confines. A few conclusions become clear when we understand this: that our most cruel failure in how we treat the sick and the aged is the failure to recognize that they have priorities beyond merely being safe and living longer; that the chance to shape one’s story is essential to sustaining meaning on life; that we have the opportunity to refashion our institutions, our culture and our conversations in ways that transform the possibilities for the last chapters of everyone’s lives. They read it too: Reading the End, Sophisticated Dorkiness, you? Between you and Jenny writing about this, I think I will get around to reading it myself. Especially as my parents age, these things are important to think about. Same here, and that's both why I was glad to read it and why I really wanted to put it down, cover my ears with my hands, and sing LA LA LA LA LA loudly. That impulse is exactly what the book is about, which is both great and terrifying. Anyway, I think you'll like it a lot. Now I want to read Gawande's other books, because on top of everything else he's an excellent writer. Ana -- This is a topic about which I generally feel it's easier to do the LA LA LA bit (and I'm sure I'm not alone). If I don't look at it, then it's not there and I don't have to deal with it, right? But obviously that's silly. Reading your review, I got the sense that this is a book I *need* to read, even if it's hard. And honestly, knowing what I do of some of Gawande's other work, I'm sure he's an incredible guide. A friend of my sister's, Brad, just went through the health decline and then death of his father. He posted on Facebook about it in a very open way. When it was known that the father was nearing the end of his life, it was decided that the Brad's parents would move from Ohio to live with Brad's family a couple of states away in Illinois. Obviously, this increased the stress in the home with added responsibilities and concerns, but it also meant the creation of memories as Brad's daughters got to spend time with their grandfather nearly every day. Many friends gathered in support, especially as Brad was very open about when he needed help. It was still a very hard time. I haven't read any Gawande yet, though I have Better on my shelves. Being Mortal is also one I know I must read. Thanks for your revew.